Our Hosted Farmstays are a rewarding and memorable experience for both the guests and their hosts. Our Farm Hosts generously open their homes to provide this unique opportunity to share their Australian farm lifestyle. Whether you stay for a night or an extended visit, you will be welcomed as part of the family. Without the hospitality of our Farm hosts, our successful service would not be possible. 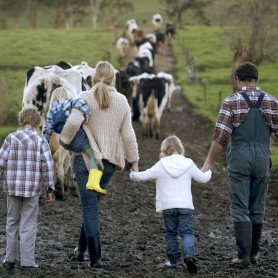 There are many preconceived ideas about what is an Australian farm family. Throughout Australia, we have access to over 2000 families and every family is different. Contrary to popular belief, we are not all blond haired and blue eyed and are a multi-cultural society. Particularly many of our farming regions were started by other nationalities and have been passed down through the generations. Most importantly, all our families, no matter what nationality or structure are devoted to giving YOU the best possible memories whilst in Australia. Check out some of the wonderful memories and feedback from our guests here. Are you interested in hosting guests on your farm for overnight Farmstays or a Behind the Scenes Tour?